Valentine's Day....this day is so intriguing to me. As with so many things, this day can be such a source of joy and love for people, but it can also be one of bitterness and depression. When faced with those two options, I am always going to go towards the first. If you know me at all or have read any previous posts on this blog you may realize that no matter what life throws in my direction one thing will always remain constant and that is my love of LOVE. I believe in it's power...the love you have for yourself...the love you have towards a significant other....the love you have for family...the love you have for friends...love for pets....love of music....love of looking at old pictures and reminiscing...love for or of anything really...i love LOVE. No matter what, that will always remain true! So, of course, Valentine's Day is a favorite of mine. It is sort of the same feeling you get at a wedding watching the grooms reaction to the bride walking down the aisle, or the moment when the maid of honor or best mans voice cracks with emotion during their speech all because they love the bride and groom so much. Watching the love swirl around everyone on this day is magical. The smile on the face of the girl in the office that receives flowers, the excitement on the face of the kid whose parent brings in goodies just for his class...love is everywhere and I enjoy every minute of it. I may not have received flowers, or gone home to a surprise dinner...but I received a card from my parents that was perfect...i received a card from my cousin that made me laugh...I watched as two best friends at work exchanged cards just because they love their friendship...I got to see so many couples remembering why they fell in love with each other and celebrating it. I may not have someone "special" on Valentine's Day but I really don't believe that is the point of this day. It's about celebrating the greatest thing in the world...LOVE. "too soon old, too late smart"
Thanks to my mom and dad I hope I will never live by this quote...this is the life lesson they have tried to teach my for years and I am happy to report I have listened. Happy Valentine's Day everyone...I hope this day has been as filled with love as mine has, and if it hasn't try again to see things differently tomorrow and I know your day will seem a whole lot better. "I can't tell you what it really is, I can only tell you what it feels like." This specific lyric has spoken to me since the very first time I heard it. The rest of this song is extremely emotional and graphic and this lyric could easily be missed if you don't listen really close...but since I always listen close it is one of my favorite lyrics to date. It is such a simple lyric but sums up everything I try to do when I write on this blog. If you are really being honest in what you write you realize it can sometimes become frustrating because (just as the song says) although I can't tell you what things might really be, I can always tell you what they feel like. Isn't that the case for most things...it sort of goes along with "there are two sides to every story" Of course there always will be, because things don't feel the same for everyone and for some people it can be extremely frustrating trying to explain how they feel. I guess I love this lyric the most because it is simply about expressing how you feel and hoping it can explain to the best of your ability what things really are. The ironic thing for me about this powerful lyric is who wrote it...Eminem. I have always liked most of Eminem's songs, they are catching, sometimes funny...but I never really thought they were powerful or emotional until recently. Once I heard this song I started looking in to more of his lyrics and found that Eminem can actually be emotional and moving. Give some of his songs another listen...sure he may go a little over board with violence (which, for the record, I don't support) but he also has some pretty amazing things to say as well, who knew? I spend a lot of time on the computer reading other peoples blogs and getting great ideas and inspiration for so many things. A list of some of my favorites is on the sidebar of my website you can check out if you get bored one day. 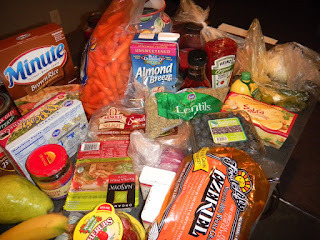 As you probably have figured out by now, I have been semi-vegan for over a year now partly from reading these blogs....and just when I think I might start to incorporate meat back in to my diet even just a little bit, I am reminded in so many ways why I eat the way i do in the first place. First thing....the Oprah show the other day just took the 7 day vegan challenge and discussed how great and fairly easy it was for most of them. They discussed how so many American people are literally addicted to fast food and sugar. they also took a tour of a slaughter house...and although that particular place was one of the cleanest and most "humane" I was still so disturbed by what I was watching a vegan diet seemed like an even better idea to continue. I plan on really giving this my full attention...eating vegan and making an effort to exercise most days for the next 30 days. I really want to get healthy!! If I can keep that up, then i will continue and see where this goes. I feel like if I share this goal on here...then I am held more responsible for completing it. If I get really crazy I may post a before shot...or maybe I'll just wait and see if the after shot is even that great...hmmm!?!?!? 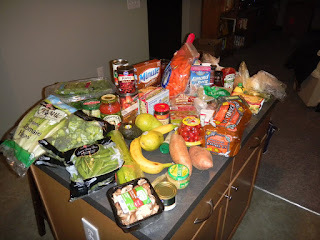 I told you I bought alot of healthy stuff.. I have still not figured out just how to maintain my personal blog (this one) and continue writing creative blogs on http://www.skirt.com/ so I figured if I write a post on that website I will just include it as a link on this blog. Also just a little update...we are officially moved in and I am happy to say I am now a resident of downtown Columbus. We had soooo many people that helped on moving day and it made it so much easier so thank you to everyone from the bottom of my heart...you are all the best!!! We are slowing unpacking and decorating and things are coming together great. Hopefully we will be having a "home" warming party soon, but until then I will enjoy exploring the neighborhood. 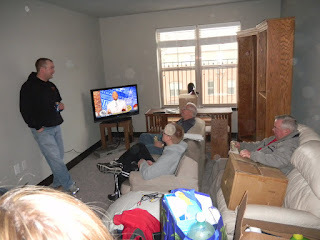 A picture of some of the guys relaxing after the big move. Although we liked the stadium seating, we did not keep the couches this way.